We all love a Sales Person with real grit and determination don’t we? Someone who never gives up and fights to the bitter end? Well we shouldn’t because they are wasting their time and maybe yours if they are flogging a dead horse. A dead horse is what we call an opportunity that will never result in a sale. You might be surprised just how many opportunities are a complete waste of time. Around 57% of lost pitches end with the customer doing nothing. And in many others the competition was set up to win long before the RFP was issued. The time to prepare a proposal has, in my experience, doubled in the past 10 years. One of our clients in the software industry has to spend up to 100 person days and it takes almost as long to write a losing proposal as a winning one. The increasing use of RFP processes that require up to 7 companies to submit a proposal means at least 6 of those companies - and sometimes all 7 - will have wasted their time. So 100 days times 6 amounts to 2 years of wasted time! That’s time that could have been spent on a proposal with a better chance of success. You need to make sure it’s not your time being wasted. Why do Sales People keep flogging dead horses? There are plenty of reasons why Sales People might flog a dead horse. The people running these RFP processes are desperate to make sure they get enough proposals to validate the process and will do anything they can to keep you in the race. A Sales Person who struggles to find leads or is under pressure to keep their pipeline full may be tempted to keep working on an opportunity that is a waste of time and the more work you put into a proposal the harder it becomes to stop. How well do you qualify? The secret to avoiding those time wasting dead horses is to qualify every opportunity thoroughly. And you should qualify early and not just once. We use a tool called an Opportunity Qualification Profile. The tool works for every kind of industry but the specific criteria you use will depend on the business you are in. What you are most interested in are the clear NO GO criteria. If you red stamp one or more of these key criteria then you should stop work then and there. It’s a dead horse. Let me explain how the tool works then this will make more sense. This is a simple tool, you can use a spreadsheet to create your own. There are four columns headed Criteria, Description, Status and Action. For instance, the first criterion is Customer Profile and the description is ‘The match with our target customer profile is good’. Another criterion is Buying Centre and the description is ‘We understand the roles for this opportunity and access is possible’. The Status column is where we use our stampers. We use coloured symbols so you can you can see the state of the opportunity at a glance. The green thumbs up symbol means that the criterion is met and we have a competitive advantage, a black check mark means the criterion is met but it doesn’t give us a competitive advantage. A red question mark means the situation is unknown and the red warning symbol is used to highlight critical issues. It’s not as simple as any red symbol means NO GO. A question mark means, clearly, the situation is not clear, at least not yet. And the red warning sign should only mean NO GO if it applied to a critical criterion. These are some criteria that, despite being important are not NO GO in my view. If you make a really good business case you can persuade clients to adjust their budget. A Coach can make a significant difference but you can keep working without one. If you are able to give your influential contact the information to sell internally you can work around a lack of access to the Buying Centre. If we have a red warning symbol against any of these criteria I rate the opportunity NO GO. Here’s why. Many of the opportunities that resulted in the customer not buying anything result from a lack of urgency. The Endorser, who provides the final sign off, must be able to see how the investment will help achieve a corporate goal. For instance, our client in the mining supplies industry was suffering because manufacturers started to sell direct. They had to shift from selling products to selling a service so they urgently needed to change the way they sell. If you know key members of the Buying Centre have an existing relationship with a competitor or they are familiar with their product and like it then it’s a NO GO. Particularly if there is no way to demo your solution and prove it is significantly better. If you don’t have the resources required to win then you are wasting your time on that opportunity. Pursuing a sales engagement with a B team isn’t an option that works. If you know your solution is not right for the customer, even if they think it might be, walk away from the opportunity. I did exactly that recently when a government agency approached me to run a course on emotional selling. I looked carefully at what they were asking for and it is just not what we are strong in, so I thanked them for considering Infoteam and declined the opportunity. It is better to look carefully at an opportunity early and make a GO/NO GO decision based on careful analysis than waste valuable time flogging a dead horse. How often do you waste time on opportunities that will never convert? 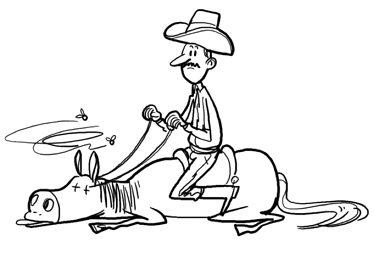 Do you think people in your team pursue dead horses just to keep their pipeline full? Do you think you can improve your win rate in qualified opportunities by reallocating the resources wasted on dead horses?